THE Deputy Governor of Anambra, Dr Nkem Okeke, has appealed to the electorate in the state to vote massively for the candidates of the All Progressives Grand Alliance (APGA) at all levels in the general elections. Okeke made the appeal at a grand finale of Sen. Victor Umeh’s campaign rally organised by a pro-group, known as Umeh Support Group, at Aguluzigbo in Anaocha Local Government Area on Wednesday. He said that the party took painstaking efforts to nominate its candidates, who would offer quality representation for their constituencies at the National Assembly. He extolled Umeh’s patriotic zeal and undiluted commitment to the cause of Nigbo and urged the people of Anambra Central Senatorial District to re-elect him for a second term. 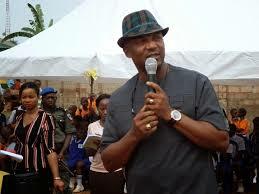 The deputy governor said: “I believe in Ohamadike Ndigbo. What he gave us in his 11-month stay at the National Assembly was complete and total representation. In his remarks, Umeh, expressed delight at the large turnout of people in all his campaign rallies in the 58 communities in the constituency. He also thanked members of his pro-groups and campaign team for their resilience and doggedness throughout the electioneering. “The journey to the Senate is not just for Anambra Central and Anambra state but for the entire South-East,” the lawmaker said. He explained that the N50, 000 empowerment given to each of the 400 rural and indigent women during the campaign was meant to give them hope. “Some of them have been neglected by leaders in the society,” he said. Umeh received gift items, including rams, plantain, wrappers, toileteries and one turkey, from the organisers of the rally. He described the gesture as a “show of love and solidarity”, saying that he had been further inspired to do more. “The campaign was successful and the election has been decided. I look forward to a credible election on Saturday,” he said. Earlier, Mr Jude Akonobi, the Coordinator, Umeh Support Group in Aguluzigbo, said that the items donated to the senator were intended to boost his morale ahead of the poll. Akonobi said: “We have seen his contributions at the National Assembly and to the constituency. “He has elected to speak for the Igbo interest, especially in the areas of appointments, infrastructure development, including a railway in the zone, among other things,” he said. Rice production: How self-sufficient is Nigeria?